The Monk Varlaam of Khutynsk lived in the XII Century, the son of an illustrious Novgorodian, and he lived his childhood years at Novgorod. Withdrawing at an early age to the Lisich monastery near the city, the Monk Varlaam accepted tonsure. Later on he settled at a solitary hill below Volkhov, in a locale called Khutyn', 10 versts from Novgorod. In solitude the Monk Varlaam led a strict life, making unceasing prayer and keeping very strict fast. He was a zealous ascetic in his tasks – he himself felled timber in the forest, chopped firewood and tilled the soil, fulfilling the words of Holy Scripture: "If any shalt not work, neither shalt he eat" (2 Thess. 3: 10). Certain of the inhabitants of Novgorod gathered to him, wanting to share in monastic works and deeds. Instructing those that came, the Monk Varlaam said: "My children, be observant against all unrighteousness, and neither envy nor slander. Refrain from anger, and give not money over for usury. Beware to judge unjustly. Do not swear falsely giving an oath, but rather fulfill it. Be not indulgent to the bodily appetites. Always be meek and bear all things with love. This virtue – is the beginning and root of all good". Soon there was erected a church in honour of the Transfiguration of the Lord, and a monastery founded. The Lord sent down upon the monk, for his service to others, the gifts of wonderworking and perspicacity. When his days approached an end, by Divine Will there came from Constantinople the priestmonk Antonii – of the same age and a friend of the Monk Varlaam. The blessed saint, in turning to him, said: "My beloved brother! God's blessing doth rest upon this monastery. And now into thine hand I transfer this monastery. Watch over and take concern for it. I do expire to the King of Heaven. But be not confused over this: while yet in the body I do leave you, still in spirit I shalt be with you always". 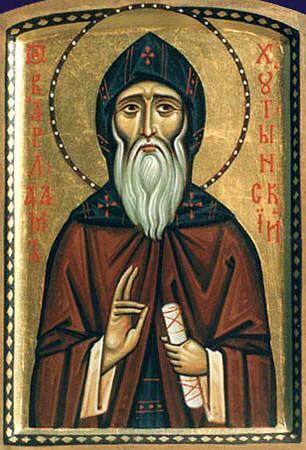 Having bestown guidance unto the brethren, with the command to preserve the Orthodox faith and dwell constantly in humility, the Monk Varlaam reposed to the Lord on 6 November 1192.